An English navigator who attained international fame, Captain Matthew Flinders was the first cartographer to have spear-headed the circumnavigation of the Australian continent. Born in the year 1774 on 16th March, Matthew Flinders made three iconic voyages between the period of 1791 to 1810 towards the Southern Ocean. The second sea voyage led Captain Flinders to an island that is now known as Tasmania. And the third voyage was commenced with a native man called Bungaree, who helped him find or circumnavigate a new mainland that later came to be known as Australia. As Flinders was returning back to England in the year 1803, his ship was in a bad state and in need of urgent repair works. This was the reason he sailed en-route Isle de France. Instead of safe passage, Flinders was imprisoned by a distrustful governor due to the ongoing war between Britain and France. Flinders was arrested and jailed for 6 long years. During the period of his arrest, Flinders managed to record all the primary details of his sea voyages for the future generation. He even suggested that the new mainland to be named as Australia, which was readily taken up years later by Governor Macquarie. Matthew Flinders was born to a surgeon who was also named Matthew Flinders. 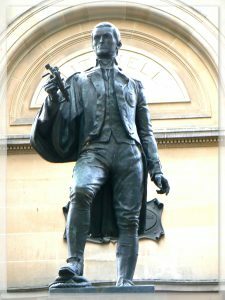 Matthew Flinders suffered from many health issues after he returned to England in the year 1810. Sadly, the great voyager did not live long to enjoy the success of his sea-adventure volume and atlas, that he had penned during his imprisonment period, known as ‘A Voyage to Terra Australis’. He departed from this world in the year 1814 and the true location of his tomb or grave was totally lost to the historians of the 19th century. Excavators and archaeologists who were exploring a London burial place (near London’s railway line Euston) this month (January 2019) were shocked and excited to find the remains of the great voyager and 19th – century navigator Captain Flinders thus making their HS2 project super successful. Captain Flinders’ coffin was buried along with some 61,000 human skeletons. The date on his coffin read 23rd July 1814. The discovery of skeletons was unearthed due to an exploration project going on since October 2018, between London area and Birmingham area for the future construction of a grand high-speed railway line project costing around £55bn. It is said to be one of the 60 prime archaeological sites in England. As per historical records, it was hinted that Captain Flinders could be among the thousands of bodies that were buried at the site during the early 19th century when Euston rail line was expanded. However, the report did not have credibility, and historians felt it was highly unlikely that the body of Flinders would be found and identified among other skeletons. But this wondrous discovery of the body of the sea explorer Captain Matthew Flinders has been received by great enthusiasm worldwide, especially by the citizens of Britain and Australia.